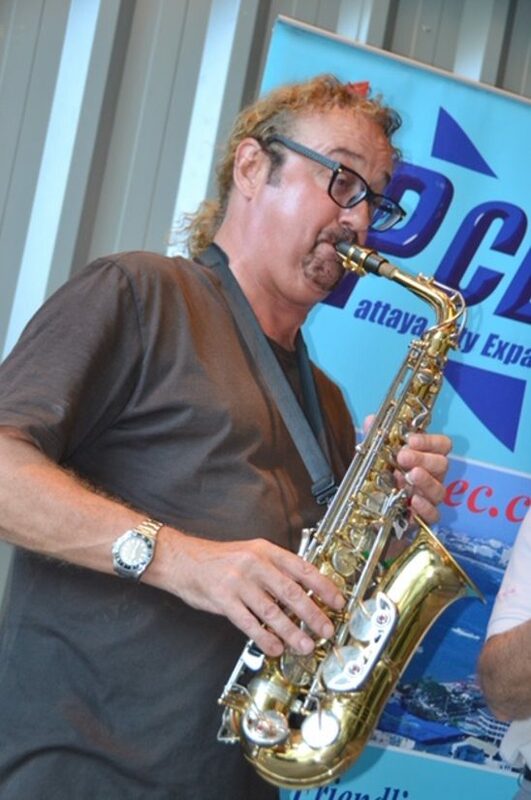 Despite being up and performing in a local Pattaya venue until 02:30AM, our entertaining speaker this week not only got up early but regaled the PCEC crowd with delightfully relaxing vocal and instrumental renderings. It was a real treat! After substitute chair Ron Hunter dispensed with the usual beginning announcements and the introduction of visitors, he introduced Mark Hodgkins who took over like the professional he is. Now 52, he began singing in his hometown of Scarborough, England at the age of 11. He sang at church and wherever he could. Thailand has been home to his talents now for a little over 30 years. He began his Thai musical experience at the Brown Sugar Jazz Club in Bangkok, which he says is still going strong. 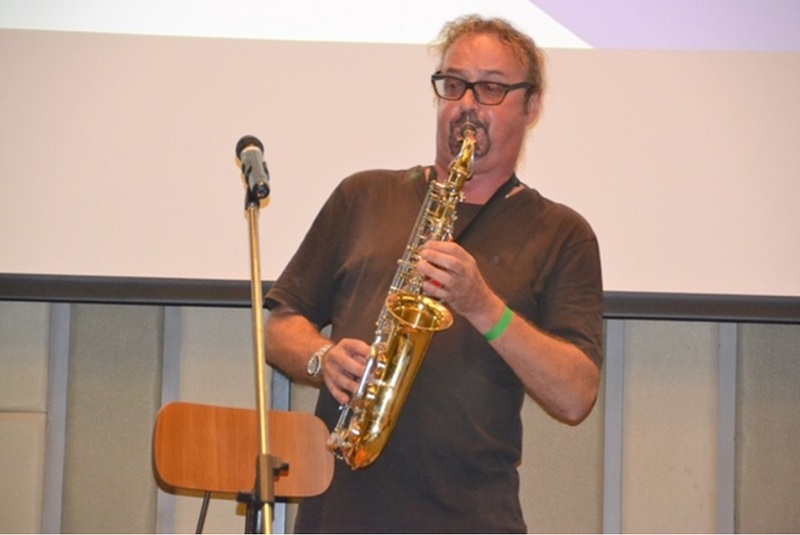 Despite loving jazz, Mark advised that to make a living in performance you need to be flexible and that’s why he added Sax to his repertoire to broaden his appeal. In Pattaya, where he now resides, he has had gigs at the Sand Club and at La Costa on Walking Street. Mark has a Thai wife and three children and first came to Thailand in 1988 to visit family. Since he found a good home for his skills he has been here ever since. Mark bought property in Naklua some 12 years ago and says buildings in the area were significantly sparser – not much between where he bought and Walking Street. How Pattaya has grown! ‘God Bless the Child’ was his first offering, and despite being the first song of a very early AM for him, was sung with panache complemented with a remarkably Kenny-G sounding sax. Mark claimed it was the first song he ever knew the words of. His other offerings were Louie Armstrong’s, ‘What a Wonderful World’, a nice jazz pop cross over ‘Ain’t no Sunshine When She’s Gone’ and Sting’s ‘Fields of Gold’. He honored the previous king’s work by performing his Wedding Song and commented that he had recorded 12 albums of Thai songs that were very popular here in country. Mark speaks Thai well. Touted as Mr. Cool by Ren, our program director who brought Mark to the club, he proved that nickname true by circulating amongst the morning crowd with his last and soulful sax rendering of ‘Georgia on my Mind’. Although he has no other future performances or gigs planned, other than a March 18 performance at Sand Club, he didn’t seem worried by that. A great and comfortable talent like his will surely find a home soon. 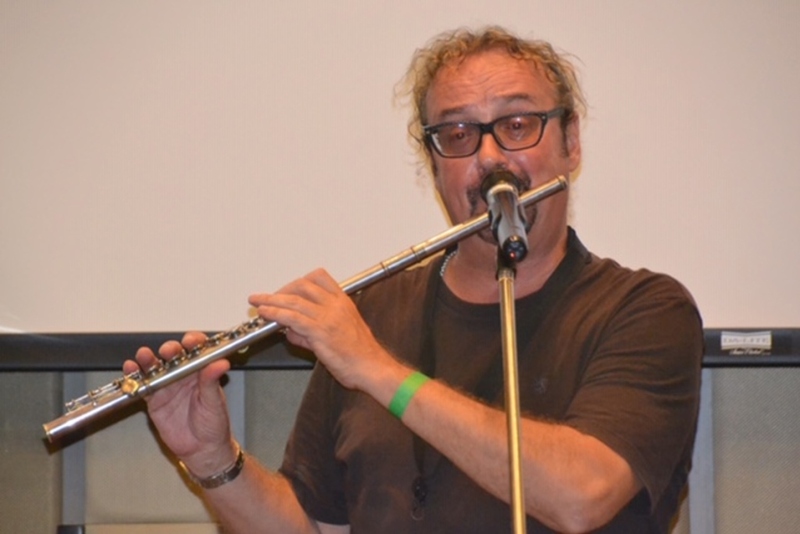 Mark’s singing and playing provided a perfect beginning to our week and the club thanks him sincerely.